Was I the only one that walked around singing "you put de lime in de coconut" while making these? I put the dough together on Sunday night, pretty simple steps. Sugar and lime zest and butter and then the flour, cornstarch and spice. Mix in your coconuts and macadamia nuts and roll out. The recipe calls for coriander but I didn't have any and used cardamon instead. The dough was super sticky but it did taste good, I might have had a taste. Once it was together I stuck it in the gallon-sized ziploc, per Dorie's directions, and rolled it out as evenly as I could in the bag. I refrigerated it until earlier today when I took it out and sliced it up. I was concerned about having gotten the dough too thin and about spreading, mainly because both of these problems came up on the Q&A. They did spread and some of mine got a little too brown, but they still tasted fine. I have to admit though that these were not my favorite but the people I shared them with seemed to like them a lot. Also I forgot to take a picture of them after they baked..oops! 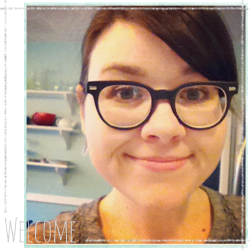 Thanks to Jayne of The Barefoot Kitchen Witch for this week's selection! I can't believe it's time to start working in the garden again. It seems like it was only a few months ago I was picking off tomatoes from the vines. I started some sugar snap pea seedlings in mid-February and they lived in my bathroom until two weekends ago when I moved them out to Doug's workshop to harden them off. Last weekend I planted them in the garden, peas like cooler weather anyway and even though our last frost date isn't until mid-April I'm not too worried. Worst case scenario is that I'll have to go cover them up for a night. We still need to concoct a pea trellis, Doug's trying to come up with some structure plans but they should be okay for a little longer. My Seed Savers order came last week too, so I spent some time making seed tapes to make things easier when I plant them. I got directions on how to make them from Organic Gardening magazine. It's just newspaper strips and a mixture of flour and water 'glue', super simple. I can't find the exact article I used but if you Google 'homemade seed tapes' you'll find the directions. For me at least I prefer the seed tapes because seeds for carrots and lettuce are minuscule and they're hard to see when you're putting them in the dirt. On the tape it's much easier to see them, plus they'll be perfectly spaced. We still have a ton to do before the last frost date, since we're expanding Doug has to get more beds built and I need to till up the the ground where the new beds will be going. Signs of spring are everywhere now, my hostas are poking up out the ground, our cherry blossom tree that was a housewarming present from friends, is blooming, my Japanese maple has leaves again and there are teeny, tiny figs appearing on the trees. I have my friend Lynsey to thank for getting me interested in estate sales. She introduced me last fall. Doug and I started going together in January, he likes to look for older woodworking tools and I like to look for linens and books. One of the first things we bought was a stereo/record player, it was $10 and I think it's around the same age as I am. Since it's purchase, we've been building a random collection of records. Prior to this the only record I ever owned was the Dirty Dancing soundtrack. I could sing every word of "Hungry Eyes". Some Saturdays we have no luck and go home with almost nothing, but this past weekend we came home with a Jeep full of stuff. It's all the record player's fault. We needed a piece of furniture to set the player/speakers on in the living room and at the first sale of the day Saturday Doug noticed a console General Electric record player, we think its from the early 1960's. It's in almost perfect condition, the exception being that it doesn't work right now. Mr. Fix-It thinks he can get it to work but even if he doesn't it's a nice piece of furniture. Doug cleaned it up and we relocated it to the living room. It's kind of perfect there. The next sale we went to I found this framed map of "The Ghost Fleet of the Outer Banks" - it was $10. Doug found an assortment of records, mostly musicals and classical but he did catch a Dylan Thomas recording and he found a hardback of Kinsey's Sexual Behavior of the Human Female. The last sale we went to was alerted to us by Lynsey because it had a ton of records. And it was a crazy little house with a lot of stairs and a creepy collection of dolls. Doug bought nineteen records there, mostly KISS (not my choice). We called it a day after that. When we got home I did a little internet sleuthing and found that the Kinsey book is actually a first edition, in great shape, just missing the dust jacket. It's the best find we've had so far because we only paid $3 for it. Oh and when we opened the book, this photo of two Siamese cats, dated 1954 fell out. My posting is late again, oops! This week's selection was Blueberry Crumb Cake, chosen by Sihan of Befuddlement. In my baking life I've never made a crumb cake, which seems silly since I'm always baking. I guess it never really called to me? At any rate I waited until the late minute (ie Monday night) to make the cake so I was in kind of a hurry. I used the blueberries, although Dorie says you can use almost any fruit/berry. I'd like to try it with raspberries and peaches. My favorite part was making the 'crumb' part, which was just butter, sugar and walnuts (my memory is fuzzy so there might have been something else too). 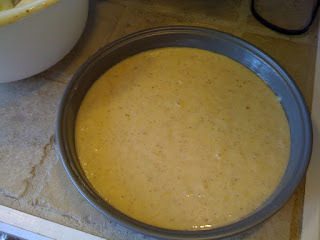 The cake part was pretty simple, dry ingredients, buttermilk, sugar + butter and then eggs. The only noticeable difference from most cakes I make is the rubbing the lemon zest into the sugar, which we also did last week. Lemon-scented sugar smells so good, I think you can do the same thing with vanilla bean and I might try that soon too. The cake batter was really thick and a little difficult to even out in the pan but I managed. Before you put it in the oven you take the crumb topping, break it up into pieces and lighting press it into the top of the cake. My cake baked for about 55 minutes, it also rose a lot, especially in the middle. So much so that the topping spilled down the side of the pan. I had to put an aluminum foil tent on the top of the cake during the last 10 minutes of baking because the top was already pretty brown. Doug and I each had a piece while it was still warm and we both liked it. It would have been better with coffee but it was going on 11:00PM and it probably wouldn't have been a good idea to brew a pot then. The rest of the cake I wrapped up and took to my knitting group last night. I haven't gotten their reviews yet but I assume they liked it. Thank you Sihan for your selection! In these particularly depressing economic times, I think everyone is trying to make changes to the way they spend. One of the things we (the husband + me) are really bad about is wasting food. I always have the best intentions when I store leftovers but inevitably we forget about them and they become something akin to a science experiment and weeks later we draw straws to choose who gets the job of cleaning them up. I'm also guilty of letting things expire without using all of it. I know it's extremely wasteful and last month I read a column from our local paper's food & dining columnist about "Eating Every Bite." It inspired me to start trying to do this myself. I can't say I've done well lately but I'm making an effort and that's a start at least. Yesterday I spent a lot of time working in the garden and by the time 5:ooPM rolled around I was tired and hungry. I hadn't set anything out to defrost so I had no meat for an entree but I did have some staples. I knew I had eggs that we going to be going south soon, so my first thought was quiche. But I was feeling way too lazy to actually make a crust so I Google-d 'crustless quiche' and found this recipe from Mark Bittman (of "How to Cook Everything" fame). I was out of cheese but I did have a handful of fingerling potatoes and a yellow onion - jackpot. I cut the potatoes and onion into bite-sized pieces, sauteed them with a smidgen of oil, salt, pepper and tarragon until they were golden. 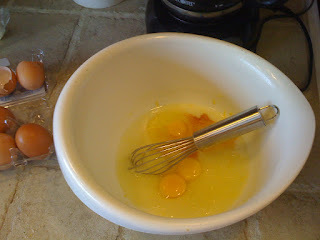 Then I mixed up the eggs and cream and added the potato mixture. I buttered two mini-tart pans and one little bee cup from Bridgman Pottery (I finally used them to cook with Melissa!). After I buttered them I dusted the bottoms with very fine breadcrumbs just to soak up any extra moisture. I poured the mixture into the pans and sprinkled the tops with a tiny bit of fleur-de-sel and popped them into the oven for 35 minutes. They came out perfectly, the one in the bee cup puffed up beautifully, like a souffle. They were tasted great and were perfect individual-sized servings. It's a really versatile recipe, I'm already thinking this would be a wonderful entree for say, a Mother's Day brunch? Maybe with baby greens and fruit salad on the side? The best thing is besides being tasty, I was able to use up eggs, heavy cream, potatoes and an onion that were coming to the end of their 'shelf-life'. When I read the description of this recipe I knew I was going to like it. I was not disappointed. Fairly easy recipe to put together. And unbelievable, there was no butter in it AND I didn't have to pull out my mixer! Granted there was oil instead of butter but rarely is there a TWD selection without butter. 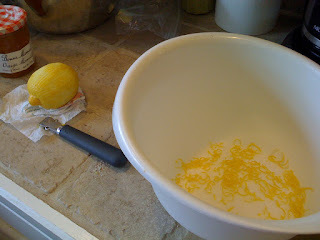 As the recipe called for I used ground almonds in the batter and lemon zest. The cake is described as a cross between a chiffon cake and a pound cake and it seems that it's also a staple in French recipe boxes. I made my cake in a 9" inch round cake pan and it took about 35 minutes or so. It got a really nice golden crust on the sides and the top was puffed (just a little bit) and golden brown. Dorie calls for a marmalade glaze to top it off or in the "Playing Around" section she gives some more options on serving it. One of those was to make the cake in a round cake pan, just it into two layers and fill the layers with curd or jam. I did something like that. I cut the cake into two layers, made a syrup of fresh lemon juice, sugar and a tiny bit of water, boiled until it was reduced by half. 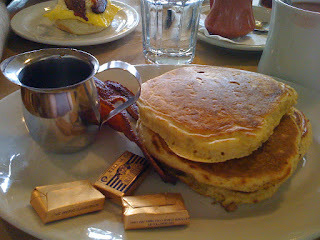 Then I poked holes the the bottom layer with a fork and poured the syrup over. I also made fresh whipped cream (heavy cream + sugar + vanilla) and frosted the two layers with it. The only problems I had were self-created. I didn't let the cake cool quite long enough before unmolding it from the pan and part of the bottom stuck in the pan. And again, I didn't let it cool long enough before frosting it with the whipped cream so it was a little melty. But I was still really happy with the results. A very tasty, simple and versatile cake. The husband person liked it, which is always a good sign since he's so picky. I shared some with our neighbors and they seemed to enjoy it too. Thanks to Liliana of My Cookbook Addiction for this week's selection! Here's my way late post about our road trip last weekend. We had planned on going to New Orleans and up until Thursday night while we were watching ER (don't laugh, Doug's the one who watches it) that's where we were going. Then I got a wild hare and suggested we go somewhere else we hadn't been before. 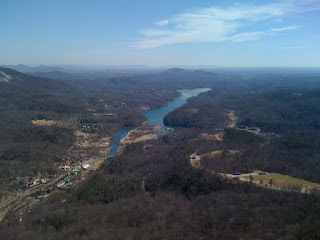 So we settled on Asheville, North Carolina, an 8 hour drive from Memphis. I love car trips, I can get a ton of knitting done, at least when I'm the passenger. I drove the leg from Memphis to Nashville and let Doug drive the rest of the trip. 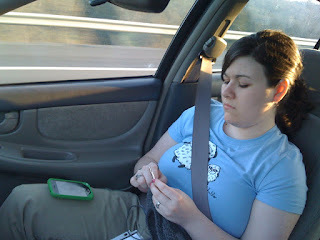 He snapped this on the road, apparently I was concentrating really hard on my knitting. It's a long drive, but as you enter Middle and East Tennessee the landscape changes into mountains and plateaus and it's so pretty. We got into Asheville around 8PM or so. We would have been there sooner but we got lost on the way to the hotel. Apparently the difference between Woodfin Avenue and Woodfin Street is a big one. We stayed in downtown Asheville and it was charming and busy and full of shops and art galleries and restaurants and musicians. Our hotel room was perfect with a big, fluffy bed AND chocolates on our pillows. Chocolate never fails to impresses me. The Dripolater Coffeehouse We didn't have a bad meal, everything was tasty and everyone was so friendly. There was a used bookstore (Montford Books) that had records and happened to be next door to a fly fishing store (for Doug) so we wandered around there for awhile. I bought some John Updike and Eudora Welty for the library and a couple of records for that collection. Doug was ecstatic to find a KISS album and a promotional Deadwood record. Of course I found a yarn a store...or two. I tried to limit myself though. I only bought four skeins total. 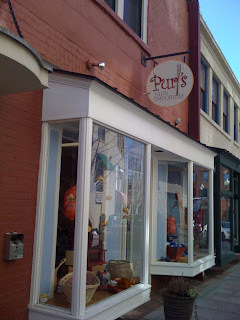 I went to Purl's Yarn Emporium on Wall Street and it was such a nice shop, big store windows with knitted dragons(!) hanging from the ceiling. The yarns were arranged by color and I tried to snap a picture but it turned out all blurry. I got two skeins of Sublime Organic Cotton in a beige-y color for a spring hat. I also went to the Earth Guild which was a few blocks away from Purl's and they sold craft supplies as well yarn. I got two skeins of white SWTC Bamboo there for maybe a shawl or something. Saturday we visited the North Carolina Arboretum. Even though not a lot was blooming they had a nice bonsai exhibit. 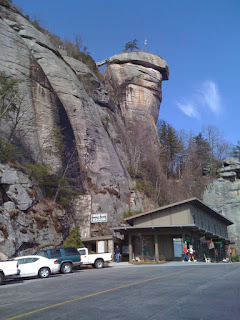 On Sunday we drove down to Chimney Rock State Park, about 45 minutes from Asheville. Again, a gorgeous drive and we had perfect weather. We climbed up to the rock via a set of stairs straight up. It only proved to me how terribly out of shape we both are. 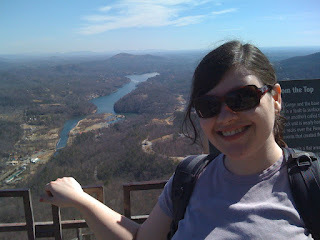 But once we got to the top it was a great view and we took the elevator down. There are some falls there too and we took a short walk over to see them. Part of the park was used to film scenes from "The Last of the Mohicans" if that tells you anything. See the top of the rock? That's where we walked to. We didn't have nearly enough time to see everything we wanted to, so we'll have to go back. I was really impressed with how beautiful the landscape was, how walkable the downtown was and how much art there was everywhere. It's teeming with creativity. Another fun car trip, although we're almost always ready to come home by the end. We miss our cats (now you can laugh). I skipped out on TWD this week because we were out of town. I had hoped to make it before we left on Friday but life happened instead. This will be the last one I miss for awhile (unless something crazy happens). I'm looking forward to the French Yogurt Cake with Marmalade Glaze this week. But you can go see a few of the TWD blogs I read every week. Or even better, go see the full list of TWD bakers here. (to the right on the page). There are so many great bakers out there. The full name of this cake is "Chocolate Armagnac Cake - The Cake that Got Me (meaning Dorie) Fired". One of the fun things about "Baking" is that Dorie has stories throughout that explain how she came to create or alter the recipes. In this story she tells of her job as a pastry chef making desserts for a NYC restaurant and how when she altered the recipe slightly, omitting to tell anyone, she was fired. But she did end up with a delicious variation on a tasty cake recipe. I used the prunes as called for, but not the Armagnac, instead using Scotch, which was what I had on hand. The batter went together easily, lots of dirty bowl though. I had never flambe-d anything before and given my proclivity for kitchen injuries I was a little concerned. So I involved my husband, just in case I say, caught my hair on fire? I worried over nothing because the flambe(ing) was super easy, I just removed the pan from the stove and lit the alcohol. It took a few minutes for the flames to die down and then that was it, no injuries sustained. When the cake came out of the oven it smelled and looked divine. And I hadn't even made the glaze yet. I seriously couldn't wait so I cut a tiny little piece out and it was wonderful. The prunes made it extremley moist but there was no overwhelming prune or scotch flavor. Once the glaze was on it was even better. A delicious cake, which is always a success. Thanks to Lyb of And then I do the dishes for this week's selection!